It would be so helpful if you had the option to select and attach attachments that are stored on a product to discussions on opportunities that feature that product. In our scenario as a scenery hire company, we have set plans and photos stored against the set as a product. When quoting on this set, we have to download these plans and photos and manually attach them to the discussion, which is an absolute pain when quoting from your phone on the go. A area in the discussion page that showed these attachments and gave the option of selecting them to add to the discussion would be so helpful! Change the wording of the Add button in discussions to Send or Post. It's frustrating as the attachment button is on the right hand side next to Add button and these are easily mixed up. It would be great to have the option to add attachments to discussion templates. Personally, I usually need to send new clients multiple forms to fill out in order to proceed with a rental order. It would be handy to have the option of attaching the forms to the template so that I can simply click on the appropriate template and send the forms in the rental quote discussion. 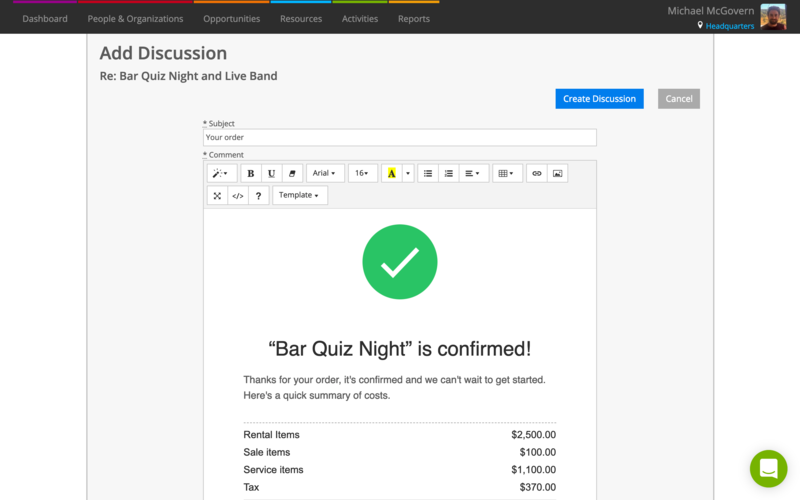 It would be very useful to link a document layout to a discussion template. the holiday season is getting closer and I was looking for an out of the office option or direct message to clients but couldn't find one. It would be great to have it, to notify the clients. I would be good if we could have auto emails in current so my clients could get an update say 1 month before the event just with a confirmation document the same again 1 week before etc. Would love to see a custom email section where we can input what ever we want & have a setting on there to send it automatically so many days before the event etc? Just a quick update on this one to say thanks for all the votes and comments – we’re watching this one closely. Keep in mind that you can use the “Discussion email address” on an opportunity to CC or BCC messages into the Discussions section of an opportunity. This is great if you’d like to send correspondence from your existing email app but wish to record a copy in Current for your reference. You’ll find a link to the email address under Actions. so I can upload standard documents (T&C's, instruction manuals, for examples) and either insert them into the Opportunity as an item (no values, just Name, and Description text) that contains a hyperlink, or Add to a Discussion thread. Populate discussions by adding a CC email address. For times when the Discussion module isn't appropriate, It would be great to be able to CC my opportunity into my standard email so that the crew can still see my correspondence. Getting a few unhappy customers with the discussion template looking quite over complicated and repetitive, cluttering up the dialogue. Ive attached a screenshot and I have to agree with them. Keen to hear if this can be super simplified. Interesting feedback here – keen to hear what folks would like to change in particular. The Current RMS application sends thousands of discussion emails per day on behalf of all of our customers. We’ve a really good reputation as a trusted sender, which makes sure that emails sent from us hit your customers’ inboxes. To protect our trusted sender reputation, we must provide tools in emails sent from Current to let people know where the email came from and how they can stop receiving further emails. We include some text at the bottom of the email in gray to do just this. You can customize the rest of the message in System Setup > Discussion Templates to add your own branding, like your signature or standard text. I'm often working at stupid hours (10mins past midnight right now!) 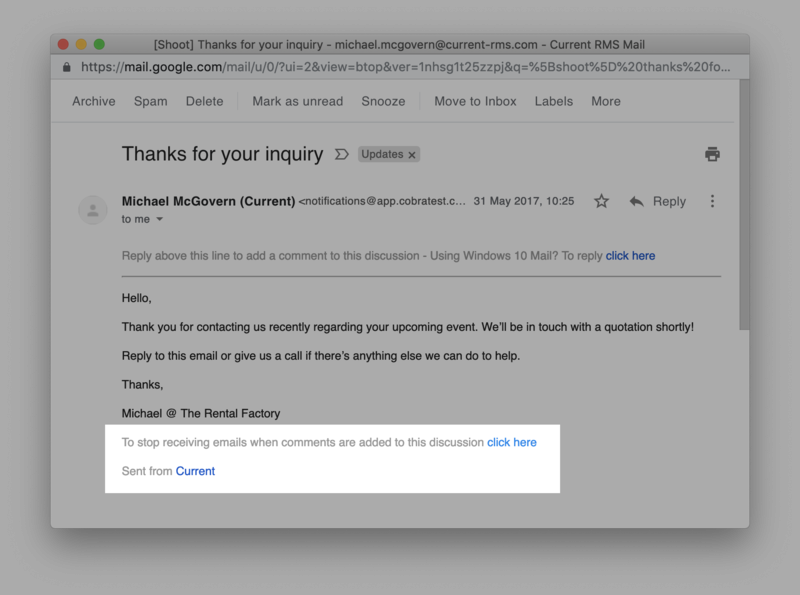 I'd like to be able to schedule a new discussion or a reply so it sends at a set time - e.g. if I raise an invoice or a quote now then my customer would receive it at 8.30 in the morning.